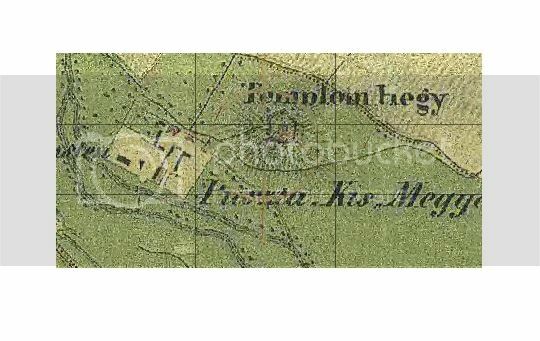 Good day everyone, I am trying to create a games table based around the Kis Megyer farm during the battle of Raab (Gyor). I have been in touch with some Hungarian gamers and have been directed to a site that shows the farm and church on the hill. 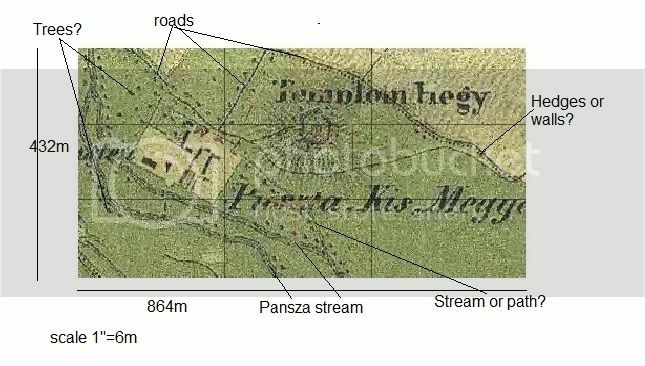 My problem is I have seen other maps showing the stream and road but the map I have is a bit unclear. OK, the roads and streams are easily identified but the dots and other marks I am not sure of. The top road could be lined with a wall or a hedge or trees. The other blobs could also be trees. Should be a nice table mate. No nothing about the battle though. Did you have any luck in regards to the map? Have you checked google maps to see if any of the existing roads roads or trees are around? With any luck the area hasn't been bulldozed to make a concrete town. Dropbear, the area is now an outer suburb of the city of Gyor but the granery is still standing. I have some info on the area from a gamer in Hungary. He has suggested the type of roads and lining them with hedges. Also the stream he said was only about 2m wide and 1 m deep.